Spoiler season is in full swing. Everyone is waiting for new cards to be spoiled. It's the time when people talk about cards and are hyped about a new set. For me this spoiler season is special because from the role of a player checking the spoiler, I was chosen to preview a card. I'm honored to be able to do so. I hoped the card I'd preview would mean something to me or would be blue. I knew the chances were pretty low, there are many cards in a set. When I received the card though it made me truly happy. It is exactly the card that caught my interest in Dominaria. It was the card I wanted to talk about. My first thoughts about the card were: 'Ha, a Vintage card!'. After a bit of thought I realized that this card could also find its home in a Modern deck sideboard. Let's look at what the card does so we can talk more about it. Here's the PureMTGO preview card including the release notes because this kind of a card usually results in many judge calls. Damping Sphere's second ability counts spells that were cast during a turn even if Damping Sphere wasn't on the battlefield as they were cast. For example, if Damping Sphere itself is the third spell you cast in a turn, the next spell you cast costs 3 more to cast. To determine a spell's total cost, start with the mana cost (or an alternative cost), add any cost increases, then apply any cost reductions. The spell's converted mana cost remains unchanged, no matter what the total cost to cast it was. There are several reasons why this card caught my attention. As a non-Standard player I usually look for cards that could be played outside of Standard when cards are spoiled and there's not many of them. Damping Sphere is also a hate card and those are very rare in Magic and are usually printed many years apart. 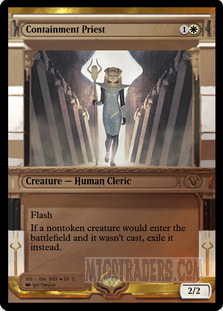 The last hate card we (Vintage and Legacy players) got was Containment Priest which was printed in a Commander product. Similarly we got cards in both Conspiracy sets. 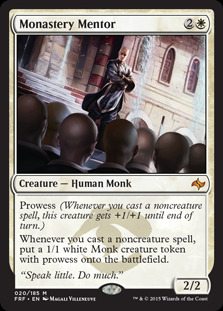 Seeing a hate card being printed in a Standard legal set is unusual. The card's design is very unique and interesting which is why the card stood out for me. So far Sphere effects (a card that taxes a player in a certain way) usually had one effect. 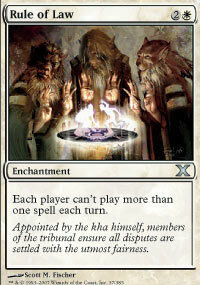 For example Sphere of Resistance makes all spells cost 1 more. 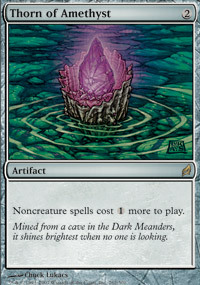 Similarly Thorn of Amethyst makes all noncreature spells cost 1 more. 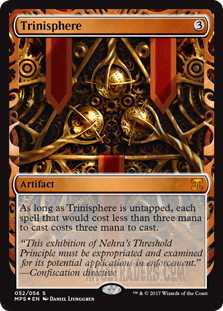 Trinisphere also has one very strong effect - As long as Trinisphere is untapped, each spell that would cost less than three mana to cast costs three mana to cast. When having one effect written on the card it was relatively easy to see what decks wanted to play the card. If a deck has a good mana production and can play a Sphere effect early they are likely to play this card against spell based decks that don't have access to 3 mana on turn 1 for example. This way Vintage Shops decks can play Sphere of Resistance and Trinisphere to fight other decks. In Legacy or Modern we also have prison decks that play Trinisphere to lock an opponent down. Other decks can play these as a sideboard card to fight combo decks. 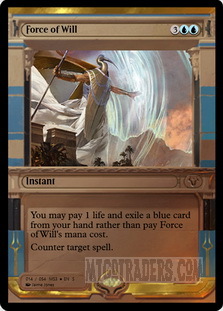 For example Legacy Lands decks will be happy to board in Sphere of Resistance. Thorn of Amethyst is also a clear choice for creature based decks that are trying to hate on spell based decks (for example Eldrazi decks). Damping Sphere though has two different effects and decks that would profit from one effect will be affected by the second effect. We usually try to find some kind of balance or try to see if the taxing effect is worth it - if we can still execute our game plan while hosing or slowing down a deck to a crawl with a card. For example, Null Rod in Vintage is that kind of a card. Against some decks we really need to play this card even though it makes all our mana rocks useless as a mana source after we resolve Null Rod. Even certain Shops (that is an all artifact deck that uses Mishra's Workshop and fast mana to play its threats or lock pieces as soon as possible) decks choose to play Null Rod because it is a very powerful card against other decks and it is worth playing it even if it slows Shops down. When looking at Damping Sphere we will have to test the card and see when and if the card's effect or effects will be beneficial for us even if one of the effects will also hamper us. Will it become part of competitive formats or will the card fail? Let's see what can make the card work and what makes it not worth including in our decks. When people look at this card and have some kind of notion how Vintage looks like they usually say that this can stop Shops and Storm. The reason why people think it can stop Shops is that it makes Mishra's Workshop produce one colorless mana instead of three that can be used to cast artifacts. Against Storm people expect it to do what is written on the card - tax the opponent when casting many spells during one turn. The truth is, this card doesn't stop either of the decks. It slows them down and that is a big difference. See, Mishra's Workshop decks nowadays are very aggressive decks rather than prison-style decks. They try to unload their hand as soon as possible. Damping Sphere when played on turn 1 against a Shops deck does not necessarily need to have a big impact. Actually it is a card a Shops deck could even play since they can start with Mishra's Workshop or a Sol land, some Moxen, a creature and Damping Sphere. I don't want to say that this is a Shops card but under certain conditions this deck could run it, the same way Shops decks run Null Rod in their sideboard while playing cards like Arcbound Ravager , Walking Ballista and all the fast mana main deck. 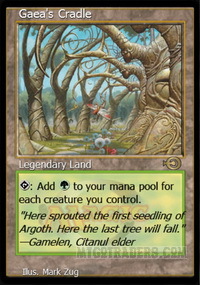 Similarly, against Storm this card does not hose the deck, it will slow it down and less efficiently than other cards. Storm decks are already ready to face cards like Null Rod which can be pretty devastating for all-in Paradoxical Outcome decks that are often light on land and some of them are actually artifacts. This deck withstood 4 copies of Thorn of Amethyst as well 4 copies of Sphere of Resistance which are still unrestricted. Storm could either win faster than enough Spheres hit the table or bounced them later in the game to win on their turn. Damping Sphere could still be good enough to be played against Shops but probably in a slightly different way than people think. The problem, as I mentioned already, is that the deck can unload its hand fast. If one could deal with what Shops has to play on turn 1 or 2 they could land Damping Sphere and control the game. If you've played against Shops you most probably ended up in a situation in which Shops deck was in top deck mode and it had a restricted amount of cards that could be played and impact the game. 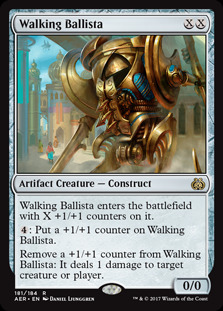 For example you know that the only card you need to care about is Walking Ballista, so you'd be keeping your Force of Will for that. When the Shops player would face Damping Sphere they will end up in a similar situation but earlier in the game which might actually give blue non-cantrip driven decks the chance to win. When I looked at the card I thought about it in a different way than just "Shops and Storm" mostly because I already thought about this a lot since the restriction of Thorn of Amethyst. When this card got restricted I wondered what card could possibly replace it in Eldrazi or hatebear decks. These decks suffer a lot by not having access to it. It was clear Wizards of the Coast wouldn't want to print a similar Sphere effect so if they'd thought of a replacement it would have to be designed in a different way. Shops decks are also very prominent and something that helps them shouldn't get printed. The way I see it, Shops decks will only become more and more powerful since they are based on playing powerful artifacts early. The cards printed thus should be quite the opposite of Thorn of Amethyst - they should help us fight Shops. 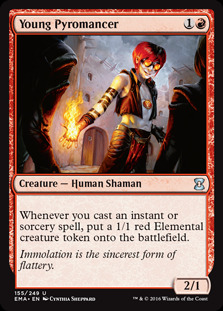 In Vintage we have cantrip driven decks that usually use a token producer like Young Pyromancer or Monastery Mentor . These are the decks that suffer when facing a Sphere effect. This Sphere will hurt those decks too. The question to which extent can Damping Sphere hurt them? What decks will want to play Damping Sphere against these decks? It does not need to be just Eldrazi or a Taxing deck running these, Landstill or a variant of an Oath deck could play these cards too. What decks can possibly run the Sphere? Decks like Eldrazi, Merfolk, Humans, Hatebears. It will affect Storm decks (DPS, Paradoxical Outcome), prison decks. To some extent it slows down cantrip-based decks, Shops and Eldrazi. Legacy is a different format than Vintage but the format also features decks that will be affected by this card. 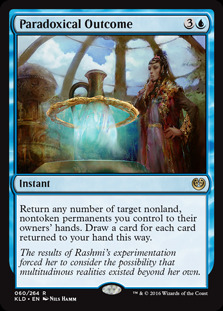 I do not think Damping Sphere will have that big of an impact in Legacy. The format has already other cards that different decks can play to stop other decks. The fact that cards like Trinisphere and Thorn of Amethyst are legal and can be played in four copies helps a lot (which is not the case in Vintage, they are both on the Restricted list). 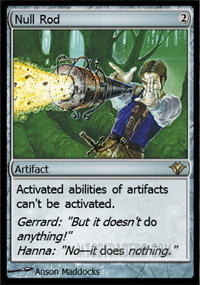 Nevertheless the card can start to see play since it is a two mana artifact which means that the card is accessible to any deck that can produce mana (Manaless Dredge is obviously not going to play this). If the metagame will feature a certain portion of decks that are affected by Damping Sphere effects, the card can find its home in sideboards of certain decks. The first deck affected by this that comes to mind is also Storm, be it ANT or TES variant which probably won't really care about this card since they are already prepared for hate cards. 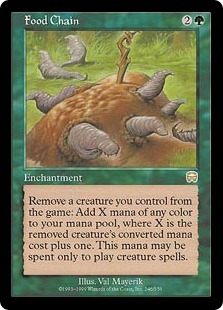 Creature combo decks though can be stopped by this card too though (we don't really see much of those in Vintage). The first to come to mind is Elves but Aluren and Food Chain are also decks that we can see at events. Against Elves both effects of Damping Sphere work very well. Lately, I've ran into Elves relatively often. I was on Death and Taxes and I have to say that I was rather sad staring at the screen while my opponent was tapping their elves, drawing cards and eventually casting Craterhoof Behemoth and attacking me for roughly 100 points of damage. 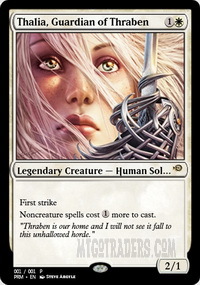 Thalia, Guardian of Thraben , a card that stops noncreature spell based decks or slows other noncreature spell-based decks doesn't do much against creature decks - it is just a 2/1 First Strike creature. Ethersworn Canonist may help in this case but it doesn't stop Natural Order or Craterhoof Behemoth being cast thanks to Gaea's Cradle and dies to Abrupt Decay . 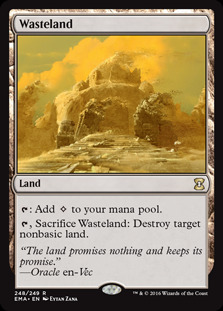 Usually a single use of Gaea's Cradle wins the game and that is something we can't stop with Wasteland . 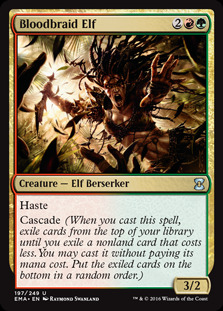 Having access to Damping Sphere though we can preemptively deal with both Cradle and the chaining of Elves (the card still dies to Abrupt Decay or any other artifact hate). What decks can possibly run the Sphere? Decks like Death and Taxes, Merfolk, Maverick, Junk Rock, or Goblins. It will affect Storm decks (ANT, TES, Spanish Inquisition), prison decks (MUD, Mono Red), creature combo decks (Elves, Aluren, Food Chain), stompy decks (Eldrazi, Mono Red) but to some extent also cantrip-based decks. 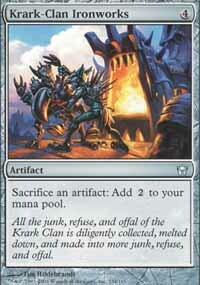 In Modern we also have decks running Sol lands, Tron lands and combo decks like Storm or Krark-Clan Ironworks combo. That's at least what comes to players' minds after reading what Damping Sphere does. Tron is a deck that has many variants and some rely more on the Urza Tron lands than others. Many decks are trying to fight Tron and try to use all kinds of available land destruction - Fulminator Mage , Crumble to Dust - or cards like Blood Moon . Unfortunately most of these cards cost 3 mana which is also the turn when Tron can be assembled. 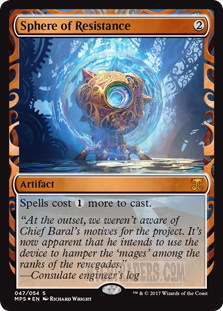 Damping Sphere is a two mana artifact meaning any deck can run this card if they choose to and also can be played on turn 2 while many other hate cards cost 3 or even more mana. If Damping Sphere would be paired with some pressure the Tron player may struggle and might lose the game before they manage to put together 6 lands to cast let's say Wurmcoil Engine . Imagine Jund for example. This matchup is not favorable for Jund even though it's not that bad either. One of the ways to destroy a land is thanks to Fulminator Mage. 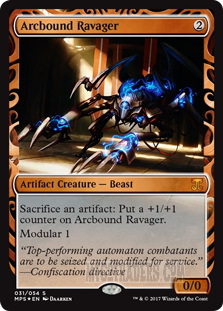 That costs 3 mana and while the Jund player also runs discard that can slow the Tron player down it may not be enough. 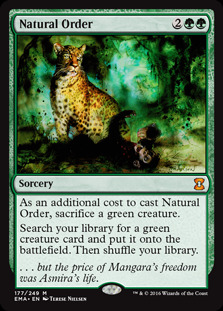 Also Jund already features many good three drops and in order to be more efficient it would need an answer that costs less mana - Damping Sphere sounds plausible. It may be a little bit awkward with Bloodbraid Elf but everything comes with a cost. It is a very small price to pay one additional mana when casting Bloodbraid Elf. 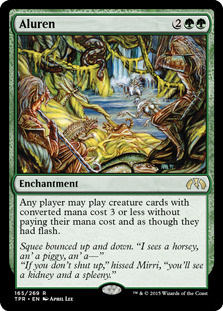 The fact Jund can actually play this card is already a big upside. 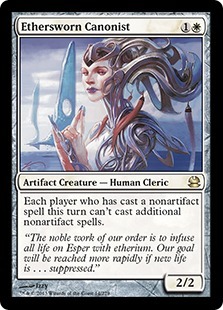 Speaking of Elves, note that this card doesn't say 'noncreature spell' but 'other spell that player has cast this turn'. I can imagine that this can make an Elf player cry (more in Legacy rather than Modern since the Modern deck is more of a beatdown). Another deck that is more dependent on sol lands are Eldrazi decks. Since they are gaining in popularity this card could be boarded against these decks too. As for Storm or KCI combo it is analogous to Vintage Storm. These decks already have access to artifact removal to stop certain cards (it has harder time with enchantments which is the reason it also runs bounce spells). This card can slow Storm or KCI deck down because it won't be able to efficiently use its mana and dig for the bounce spell or artifact hate. This card though is less efficient than let's say Rule of Law which slows down the Storm deck player way more since they can't dig that easily. One spell per turn is way more taxing than 1 or two spells per turn. Rule of Law is also an enchantment which is more difficult to deal with. Many decks started running Abrade because it not only kills an artifact, it can also deal with creatures. This way decks running red can even play Abrade main deck and board in more making Damping Sphere way worse as a sideboard option (at least for a deck that has access to white). To conclude I can see this card to see play primarily in Vintage and Modern where we can find use for both effects of Damping Sphere. In Vintage the card can certainly find its place. It gives us a way to fight different deck archetypes. The card could bring more diversity to Vintage because it could allow us to play more blue-based midrange decks that will suddenly have a fighting chance against Shops. In Legacy this card could also be an option but I think that decks already have access to cards they need. There are decks though that might incorporate this card in their sideboards. Death and Taxes or Maverick decks could profit from it since they have a hard time with Elves and other creature combo decks. In Modern the card can be good but can also be a dead card. Modern is a very diverse format now. Depending on how the metagame shifts this card can be good or rather bad. There are many decks that will need a way to deal with Damping Sphere or they will die and the decks that do not pack enough anti-hate cards may get caught off-guard. Standard is not a format where either sol lands or other special lands are common. 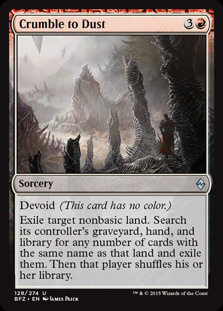 Even though they exist in the current format they have conditions that are difficult to fulfill and the format is also full of Field of Ruin taking care of that problem. The second effect is not applicable either because there aren't decks that can chain spells well - the format doesn't have access to cheap cards and enough mana to do so. Even if decks like that would exist they would need to be well represented in the metagame. 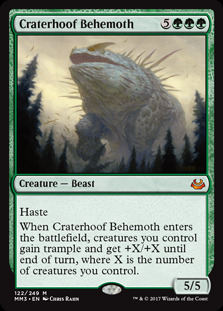 We might encounter this card in (casual) EDH as well. 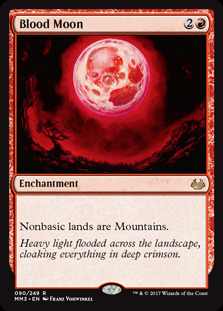 Many players try to have enough mana available to them and they either use lands that produce mana or enchantments that give their lands the ability to produce more mana (the doubling mana enchantments are not affected by Damping Sphere). Damping Sphere will to some extent limit the mana production. The card is well designed and I find both of its effects powerful, the question is how powerful they will show to be in the context of different formats and decks. Been waiting to see this card in its full glory. Very interested in its implications for the Modern format. Definitely seems like bad news for Tron and Eldrazi decks and has splash damage on decks like Storm.